Who wouldn’t be thrilled to see this colorful emoticon in their message on their birthday?! 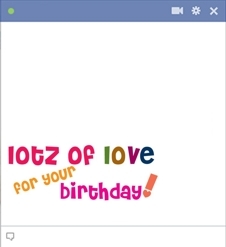 This great emoticon will also stand out in on a timeline with its sweet birthday message of love! Make someone you care about feel special with a unique emoticon that reflects their style and yours!